It may sound like something out of a stand-up-show by any comedian in the world. But it may also be a phrase very close to the heart of mathematics. Did you ever notice… that when you have been out travelling and returning home, suddenly the newpapers and TV shows are full of references to the place you just had been to? Where on earth were these news stories before you went there? I just got home from a very nice travel back and forth to Bratislava, staying at a nice hotel called Ibis Bratislava Centrum Hotel (do I get a discount for promoting work here?). 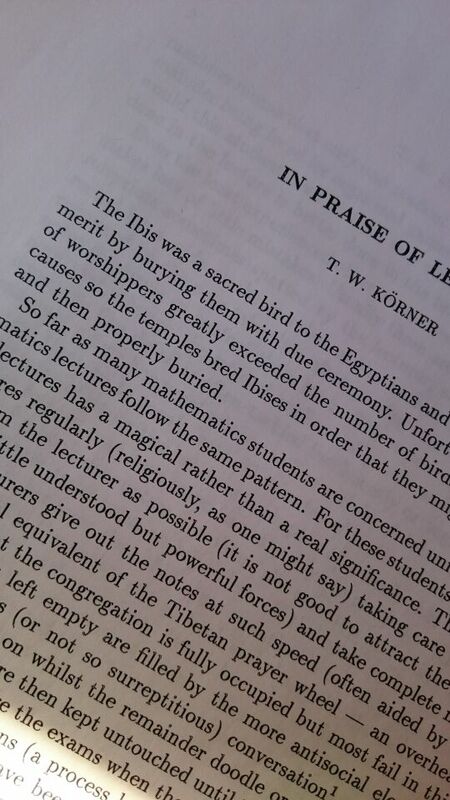 And on the train to work today I flipped through an article I have had lying on my desk for I don’t know how long, In praise of lectures, by T.W. Körner (click here for a pdf). I didn’t have much reason for having this paper around, other than the fact that I used a lot of Körner’s writing on Fourier Analysis 15 years ago for a thesis. And the point of departure was the Ibis, a sacred bird to the Egyptians. I had read this before, but since Ibis made no recollection in my mind, I just scanned those lines quickly and moved on. This time, I googled the bird, read about it, made a review of the Ibis hotel and also got thrown back with some nice memories. It seems that what we experience in life will dictate how we control our awareness. It could be people we meet, places we go to emotionally or geographically, things we perceive with our senses in one way or the other. This may not be very shocking, I mean, in what other ways could our inclinations for learning something be working with us? I think all kinds of education work in much the same way. As a teacher of mathematics I can not jump into the minds of my students and twist their brains into what I want them to look like and how I want them to act and work (and I believe, metaphorically speaking, we have all tried to jump into the minds of our students!). If I tell a thirteen year old pupil that the parameter in front of x will vary the slope of the graph of the linear function y=ax+b… then he might say “fine” and move on with his life. I know I would. Instead I could give him a very simple GeoGebra file to tinker with. For instance the standard one where you have gliders to control a and b in the mentioned expression. I could still do the mistake of telling him “Look, as I alter the parameter a, the graph slope changes accordingly”. I still don’t think this will stick to his brain, although a picture might do a better job than my words alone. And of course, the picture can also be improved, something I tried doing on a blog post on my Norwegian blog here. Better still, I could ask him to alter a (and b) with the gliders, and have him tell me what happens. That would be the equivalent of my travel to Bratislava. The stay at Ibis Hotel pointed my awareness in that direction. I can also point the pupil’s awareness in the right direction and help him make sense of his discovery. That’s basically all I can do, isn’t it? You are currently browsing the The cheap researcher blog archives for May, 2015.